How did WorldSBK’s Argentinian debut go down? The MOTUL Argentinian Round saw history made with South America hosting its first ever round of the championship. The new Circuit San Juan Villicum instantly became a firm favourite. 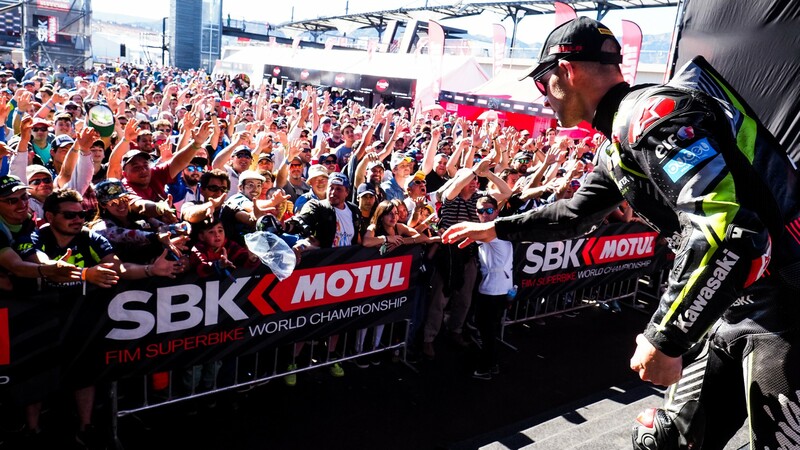 Even though Jonathan Rea (Kawasaki Racing Team WorldSBK) claimed another record with his tenth consecutive victory, it was the brand new facility that was the star of the show last weekend. It wasn't the altitude which left the crowds gasping in the Andes, it was the scenery and the facilities that left them breathless. With the track finished in recent weeks, the WorldSBK debut was the honour for the championship to host the inaugural meeting. Overall feelings from within the paddock were hugely positive, with some commenting that it is quickly becoming a favourite on the calendar. Instantly becoming a favourite of riders, the track has a huge variety of corners and some severe undulations. The main issue riders faced was the dust and dirty surface off the racing racing, all down to the track being brand new. This however helped to produce some interesting races, with riders making mistakes by running too deep into corners such as Turn 1 and being caught out, leaving themselves open to attack from behind as they scrambled to get back on line. The line was narrow in some places, with Chaz Davies (Aruba.it Racing – Ducati) finding this out in Race 1, as he crashed out while trying to overtake Tom Sykes (Kawasaki Racing Team WorldSBK) into Turn 8. The Welshman's weekend went from bad to worse on Sunday, with a technical problem in morning warm-up, but he was at least able to salvage a solid fourth place in Race 2 to maintain a comfortable lead over Michael van der Mark (Pata Yamaha Official WorldSBK Team) in the fight for second in the championship. The duo will go to Qatar separated by 24 points. It was a tough weekend for van der Mark, with the Yamaha rider struggling in Argentina but he'll be confident of bouncing back in the desert where the Yamaha has been historically strong. The Yamaha will need to be strong in Qatar if they are to have a chance to stop Rea's historic run of form. Breaking the consecutive wins record of Colin Edwards and Neil Hodgson, we have once again seen Rea make history. The next target for the Northern Irishman will be to win in Qatar to claim the most wins in a single season, and to break his own points record. Going to the desert only one win behind Dough Polen's record of 17, Rea knows the records are in sight, but he knows it won’t be easy. It was certainly a crazy race that allowed Rea to break the record. Suffering from a severe stomach virus throughout the night, Rea had to dig deep to win in Argentina. Starting from the third row of the grid on Sunday meant that Rea was going to face a tough test in Race 2. With a narrow line, it was hard to make clean overtaking moves and Rea was ragged in the early stages, but once he was able to find clear air he was able to consistently set fast times. With Xavi Fores (BARNI Racing Team) in front, Rea knew that he would have to ride like he was in a time trial to claw back a three second disadvantage. He did over the course of a handful of laps and once in front Fores put up a fight, but the Spaniard ultimately conceded to Rea. Despite this, the Ducati rider was able to celebrate on Sunday as he wrapped up the Independent Rider's crown. Enjoy all of the action from the weekend, and re-live history being made all with the WorldSBK VideoPass.